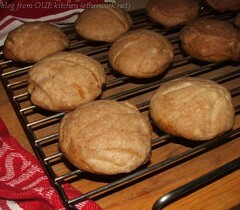 These Conchas (shells) are made from a recipe for Mexican Pan Dulce - sweet bread made with eggs and butter. The crunchy sweet topping is traditionally coloured in Mexican bakeries. I chose to let the colours of the flavourings colour the topping naturally. Shaping The dough is shaped into discs and place a ball of topping on each one. The topping is then flattened. Using the tip of a sharp knife, shell-like lines are carved into the topping. The light coloured conchas have cinnamon flavoured topping and the darker ones at the back have cocoa/ginger/chili toppings. The cinnamon flavoured topping lines were to imitate scallop shells and the darker ones (cocoa/ginger/chili) in the foreground were decorated with spirals to imitate conches. Because the colours were relatively similar, it was the only way to distinguish them. 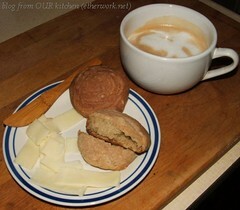 The beauty of living in Canada: we can have a Multinational breakfast: Conchas with sliced Mozzarella and cafe au lait. The crumb was beautifully soft. (Yes, it's true; even though the recipe calls for just white bread flour, I used a combination of unbleached all-purpose, 100% whole wheat and high-gluten flours, as well as some finely ground flaxseed.